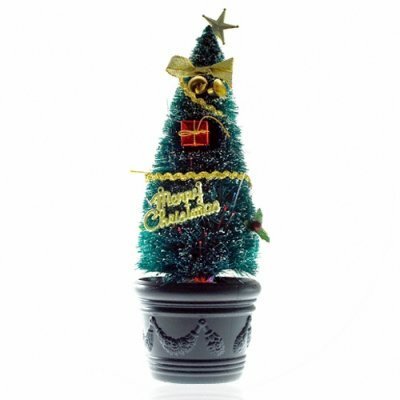 Successfully Added Tabletop Christmas Tree - Decorated Electronic Fir Tree to your Shopping Cart. Tabletop sized decorated Christmas Tree with small colored lights. This soft green plastic fiber Christmas tree has fiberoptic point lights and a finely placed white mist to make it appear like a genuine wintertime Fir tree. The CVSCW-9202 has an on/off button in the base and lights up its well placed fiberoptic point lights to gently illuminate its three holiday colors (red, green, and blue). A simple way to put some holiday spirit into your corner of the world. Tabletop Christmas Tree with holiday lights. Simple way to decorate a table or reception counter for the holiday. Small enough to be placed on any table, counter top, reception counter, etc.